1. Preheat the oven to 180˚C, gas mark 4. Put the leeks in a roasting tin and pour over the wine, 50ml olive oil and 150ml water. Cover with foil and bake for 35-45 minutes; cool slightly. 2. Boil the whole egg for 9 minutes. Cool, peel and finely chop. Beat the egg yolk and mustard; slowly whisk in 125ml olive oil. Whisk in the vinegar and 1 tbsp water; season. Stir in the egg, capers and ½ the parsley. 3. 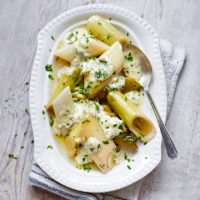 Spread the leeks over a platter. Splash with a little of the cooking liquid, then the gribiche sauce and the remaining parsley.